Not all fruits and vegetables are equal when it comes to pesticides. Some produce, like avocados, corn and mangoes, have peels or husks that shield produce flesh from pesticides. Other fruits and vegetables, however, don’t have a protective layer. Fruits like strawberries “will always have a lot of pesticide residue because it has no protective outer peel and they grow directly on the ground,” according to Sonya Lunder, Environmental Working Group’s senior analyst. On March 8th, the Environmental Working Group released its latest “Dirty Dozen” list of fruits and vegetables that have the highest amount of pesticide residue. To determine which items typically have the highest pesticide levels, the EWG analyzes tests by the U.S. Department of Agriculture. This year, they found that nearly 70 percent of samples of 48 types of conventional produce were contaminated with residues of one or more pesticides. Ranking number one this year were strawberries. (A perennial on this list.) It really is sad, because we love strawberries! We just aren’t the only ones who love them. Bugs, slugs, and fungi love to feast upon the nutrient-rich fruits and plants. The more fruit destroyed, the less the hard-working farmers can sell. To increase the harvest, most strawberry producers have developed techniques and practices that allow for maximum yield and minimum loss. 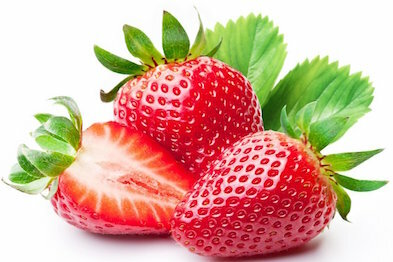 Strawberries that are not organically grown (most are not) are laden with chemical residues from pesticide and fungicide sprays used in the process of growing them. For consumers concerned about ingesting foreign substances, this is problematic. Therefore, buying organically grown strawberries is the best bet. Number two on the EWG’s Dirty Dozen list was spinach. This was surprising since last year it ranked eighth. So, why the jump to the top? This year the Environmental Working Group found high concentrations of some new fungicides as well an insecticide, permethrin, on spinach samples. So, again, your best option is to buy organic. It may be surprising to find that USDA researchers found a total of 178 different pesticides and pesticide breakdown products on the thousands of produce samples they analyzed. What’s more troubling about this is the fact that pesticide residues remained on fruits and vegetables even after they were washed and, in some cases, peeled! So what can you do? It’s wise to opt for the organically grown versions of produce, but know that no matter how much money you spend on a bounty of organic produce, you can’t cut out pesticides completely. (Organic farmers use natural pesticides made from natural sources. Meanwhile, pesticides used in conventional farming are derived from synthetic sources.) Buy organic when you can, but even if you can’t it’s still better to eat a variety of fruits and vegetables. Studies have found that including any kind of produce with its plethora of nutrients provides health benefits, especially for long-term chronic diseases. Even the EWG acknowledged eating fruits and veggies is basically always a good thing: “The health benefits of a diet rich in fruits and vegetables outweigh the risks of pesticide exposure,” the EWG writes on its site. Curious to know what produce made the rest of the list?